Yoga is well known for its calming and relaxing sequences. It’s also known to help reduce aches and pains, making it a practice perfect for women who are expecting. Monica Anderson, a group exercise instructor at the McConnell Heart Health Center, says yoga is great for pregnancy. While it can alleviate aches in the back, hips and legs during pregnancy, yoga can also help get you ready for the big day. “It can prepare you for giving birth, making you stronger and calmer. Yoga can also ease labor pains by helping you to relax the hip muscles and use gravity to your advantage,” Anderson says. “The practice of breathing and calming the body and mind will also be a great benefit during pregnancy and labor,” she adds. 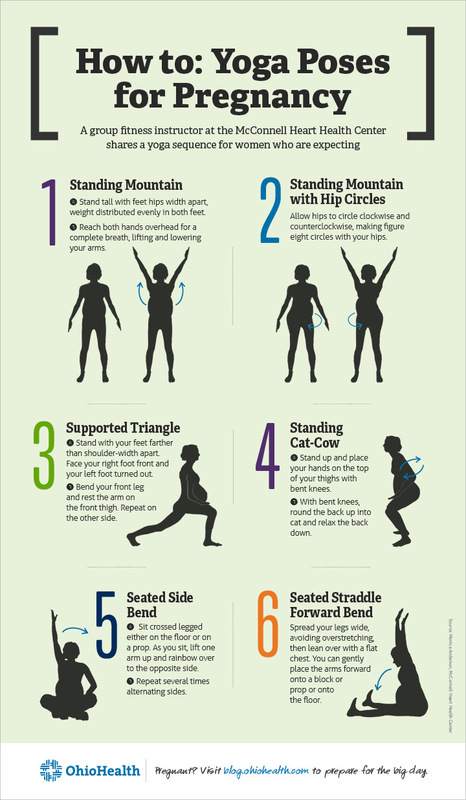 In the infographic above, explore some poses Anderson recommends trying. Below, she explains a short sun salutation sequence that can be done at home, using the poses above. 1. Start standing or sitting with feet hips width apart. Lift through the spine, arms to your sides, palms open. Place your focus on your breath and body alignment. Take four to five deep, cleansing breaths. 2. Next, begin the hip circles, allowing the body to gently sway side to side. As you’re doing this movement think of rocking your baby ever so gently. Take your circle clockwise a few times and then counterclockwise. Always remembering to fuel your movement with the power of your breath. 3. Bring your palms to the top of the thighs for cat-cow. Take one breath per movement. Continuously breathe as you round the back into cat and then release into cow. These movements can be performed standing or seated. Mountain pose and cat-cow have great benefits for back discomfort associated with pregnancy. Simply moving the hips and releasing the tension in the hip flexors can provide pregnancy relief. 4. To move into supported triangle, begin seated or standing and step your right foot out with knee bent and your left foot opened wide with toes facing forward. Next rest your right hand or elbow on the right thigh as you lean over slightly. You can hold the pose three to four breaths. Each breath should be a complete inhale and exhale. As you finish one side, repeat on the other. This pose is great to stretch the legs, back and arms. 5. If you are comfortable coming to the floor, begin by sitting on the floor or on a prop. A seated side bend can also be performed on a chair. Begin by starting in a crossed legged seat. You are going to sit up tall and begin by releasing the neck to the shoulder. Think of the ear relaxing down to the shoulder on both the right side and left. Repeat this twice on each side, holding one to two breaths. After the head tilt, you can add a half head circle right and left one to two times. With an inhale bring the right arm up and over rainbowing over the body repeat two to three times on the right and on the left. This exercise helps to reduce and relieve neck tension, upper back and arm discomfort. 6. Lastly, a seated straddle forward bend. Again this can be done on the floor or on a chair with another chair in front to rest upon. As you begin to prepare for this stretch have any props such as blocks, pillows or bolsters that you may need to lean forward on. Begin by opening the legs to a straddle stretch being mindful not to stretch too far. Always be mindful that during pregnancy, ligaments and tendons become loose and you must be cautious not to overstretch them. As you find your comfortable straddle position, hinge from the hip forward and relax onto your bolster blocks or pillows. You can hold this position for three to four breaths, repeating twice. This position stretches the hamstrings, legs and back. And as always, Anderson reminds anyone planning to practice yoga to listen to their body, let go of expectations, let go of judgment and, most of all, breathe. For more help with your pregnancy, contact our maternity care team at OhioHealth.